Did you used to love nothing more than cooling off on a hot day, with a scoop of your favorite ice cream, a snow cone or even a popsicle? 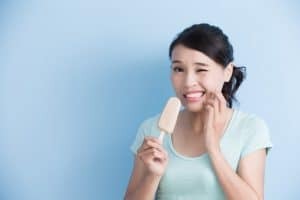 Has pesky tooth sensitivity gotten in the way of enjoying many of your favorite summertime treats? If so, don’t keep ignoring your smile’s sensitivity or discomfort. This could lead to worsening issues, including increased pain and even infection. Instead, talk to your restorative dentist about how a modern restoration, like a dental filling, should be able to help protect your tooth and improve your comfort. That way you can get back to enjoying your favorite iced treats, all year long! Cavities are incredibly common. In fact, some reports indicate that very close to 90 percent of the adults in America will struggle with them. This can result in a number of side effects, many noticeable. Heightened or extreme tooth sensitivity is one common warning of cavities. Deep discoloration is another common indicator of enamel damage, though. Grey or black lines, or even white patches, can all be caused by compromised tooth enamel. The good news is that, if a cavity is to blame for your dental sensitivity, a minimally invasive restoration like a dental filling could likely help. Modern dental restorations can even be made to look natural, so you can smile confidently, as well as comfortably, after your filling is placed. These modern fillings are often made from a composite resin material that bonds well with teeth, and that creates a great barrier against bacteria. Plus, these modern fillings are made to last a long time. Need to Schedule Restorative Dentistry? Restorative dental treatment can help to keep your smile healthy, and prevent ongoing discomfort or even infection. You can schedule a restorative dental consultation by calling Dr. Steven Huffstutler in Ft. Worth, TX at 817-577-1444.